When you talk about the price difference between economy class and business class, or business and first, you have to find some pretty significant differences before you can justify that extra cash. (Unless someone else is paying, or you can snaffle an upgrade using points or some smooth talking.) But if you're looking for a good reason, the Emirates A380′s onboard bar has to be pretty much up there. Situated behind the 74 business class seats in their staggered 1-2-1 layout across the A380′s massive width, the Emirates bar was actually a huge gamble for the airline when it first launched the plane in 2008 — the engineering and marketing guys genuinely weren't sure whether anyone would actually use it. Accordingly, the earlier A380 deliveries actually still have luggage bins where the bar is, just in case the space needed to be converted back to extra seating. But people loved it, and it's here to stay. 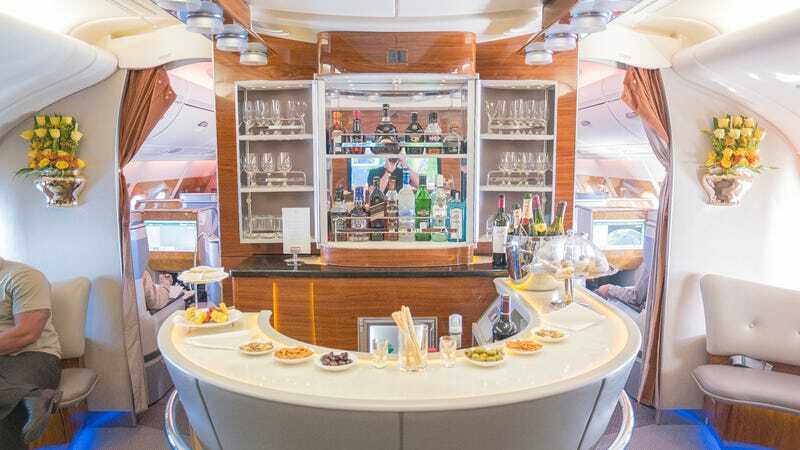 Walk to the back of the upper deck of the plane and you'll find the bar, a beautiful semicircular conglomeration of chrome and polished wood and glass, well stocked with Hennessy, Grey Goose, Bombay Sapphire, Moet and Penfolds aplenty. Plenty of snacks, too, hot and cold and available throughout the flight and suited to whichever meal is in the middle of being served — and on a 15 hour flight, there are several. The bartender is always around to mix you a drink of your choice — you can stick to Emirates' recommendations, make something up yourself, or use the inflight Wi-Fi to Google your favourite recipe. With on-demand dining, too, you can also get yourself a hot or cold meal at any time, even if everyone else onboard is fast asleep. Off to the side of the bar is where you'll find a pair of curved lounges, near the A380′s massive windows and underneath a bouquet of fresh flowers. Those bars have seatbelts, too, so you could conceivably spend a long time in the bar if you didn't feel like relaxing in your seat. Plus, you're still within reaching distance of the bar, which is a bonus for nervous flyers. Behind the bar is a massive TV, alternately playing Emirates ads and displaying a route map showing how far you've travelled and how far you still have to go. (More snacks there, too.) Behind that is the business class galley and four bathrooms, which Emirates stocks with its own particular range of Bvlgari scent for men and women. During the bar service, the two massive emergency exits are covered with temporary polished wood tables, with curved mirrors to add a sense of a little more space. The bar actually doesn't get too much of a workout on the late-night flights out of Sydney, when the plane is full of people who have had a hearty dinner and a couple of drinks before boarding in the business class lounge (yours truly included). But it still operates — there's an attendant behind the bar at all times throughout the flight, and it's always someone specially trained to mix the various cocktails that Emirates offers. Where the Emirates A380′s onboard bar shines is during the morning flight back from Dubai to Sydney, which takes off just after 10AM — giving you enough time to have an early brekky and a glass of champagne in the Dubai business lounge. (Or any other morning depature, to be fair.) The bar was busy during almost the entire flight I took; those seats off to each side of the plane have three spaces each for passengers to sit and relax, although four can squeeze on in a pinch, and they were almost always full when I visited. Apparently the bar up the pointy end, specifically for first class customers, doesn't get nearly as much of a work-out. It doesn't have any seating space, it's right next to the two onboard Shower Spas, and while the booze is a lot better (we're talking Dom Perignon, guys) said first class pax can bring their top-shelf bottlesback into the biz bar if they want to relax. Having an onboard bar is both a blessing and a bit of a curse on the Emirates A380 — if only because it makes it really hard to concentrate on doing any kind of serious work during your international long-haul flight. But I'll be honest with you, it's more of a blessing, and it's the kind of thing that really differentiates business class from economy — and makes it worth paying for. At least you can still order drinks to your seat, too. Campbell Simpson travelled to Dubai as a guest of Emirates.